Flickr isn’t just a bird, del.icio.us isn’t just your NELA luncheon, and WordPress isn’t a new kitchen gadget. Find out what these things are and how these popular Web 2.0 applications (and more!) are being used in real-world libraries. 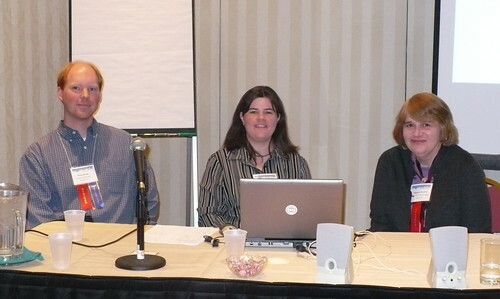 L-2-4-U offers a panel of three experienced Massachusetts librarians: Paige Eaton Davis from the Minuteman Library Network, Brian Herzog from Chelmsford Public Library, and Elizabeth Thomsen of NOBLE. They share their expertise with applying Web 2.0 technologies to help promote your library’s resources, programs, and materials. The program sponsor is ITS whose business meeting is included in the program. Elizabeth started off this panel discussion by comparing the old way of finding information to the new. Does your web site need an extreme makeover? Would you like to add Web 2.0 functionality? Is your budget for web development somewhere between miniscule and negligible? 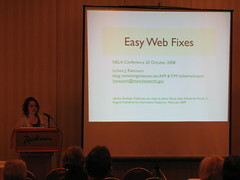 Get practical advice from Lichen Rancourt, who was responsible for bringing the Manchester (NH) City Library web site to a whole new level. Her step-by-step review offers guidance that shows you how to make changes that will bring positive feedback from your community. The original website used static html, and had grown organically (as of 7/07). It wasn’t dynamic, but does give a good introduction to the website. make it easier to update (focus more on content, and not coding). Need to focus on content, so the staff can show patrons, through the website, how active and vital the library is. More complex additions could be migrating to a new platform (which is easier to do once the content is separated from the code), YouTube, Twitter, etc. What software do you use to maintain your website? Do you get a lot of spam comments? How much time do you spend on a daily basis doing this? Most of my time is spent cajoling the staff to write for the blog. But when I do it, I try to think of it as if I am speaking to someone a cross the desk – make it short (two paragraphs) and useful. For flickr pictures, it’s maybe 5-10 minutes a day. Is google calendar your only calendar? Are these feeds all or nothing feeds? How do you know how many people use this? Web 2.0, Library 2.0, Librarian 2.0 – Updated! What is the 2.0 environment and what do you do with it? Jessamyn West from Randolph (VT) Technical Career Center describes ways New England libraries have been using new technologies, and also some old tech, to reach and interact with patrons in new ways. It’s all about ideas, examples, and links, links, links. That’s her on Casey Bisson’s iPhone. This is sort of a sequel to last year’s Library 2.0 presentation at NELA. Everyone, even small libraries, can get into the L2 game. All photos in the presentation are from Flickr. L2 is a service model/idea. Tim O’Reilly, creator of the O’Reilly series of programming books, coined the Web 2.0 term, tying together a bunch of trends in interactivity. Marketing buzzword to get people to conferences. Librarians: we can apply this to our service model. Grouping similar things together. Implication that we’re leaving behind 1.0 world. Acknowledging that we are changing the way we do business. We’re not all up to speed–not us, not our patrons/customers. But often it solves a real problem. L2 ethos: Save a Stamp. Being more useful. L2 is like obscenity–we know it when we see it. Depends on the circumstances. Relative to the alternatives. There’s no predefined list. User-centered. Librarians like to search, but everyone else likes to find! Network effects by default. Not so much just a couple of years ago. User-generated content and MARC std: we need both. We need both. Is what I’m doing reaching my users? It’s all beta. Constant evaluation is possible, not like boxed software. Change the website with the seasons. Be willing to Experiment. It’s marketing, and knowing who your users are. Go where your users are; go where you’re needed. Leave your building; help your users where they are. Linking to other libraries. Avoid data silos. (Gale Group, InfoTrac) Not findable by Google. No network effect. Many catalogs don’t support non-expiring URLs. 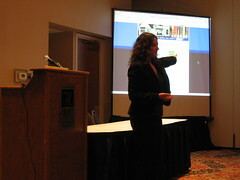 Recognize usability: Cook Memorial Library,Tamworth, NH: using Scriblio. Compare to “OPAC Name Headings Search, LC call number, charged/not charged (library jargon).” Recognize the absence of usability. Remember what easy to use looks like: RI Historical Society. Library Homepage for Distance Ed at SCSU: wow, a human works here! Plymouth State U. Also uses Scriblio. Try and evaluate: Book Notes New Hampshire. New Hampshire Reads Fahrenheit 451. Create a blog just for a project. Use the network to do what you already do. Example: Facebook group: Awesome Resources. Tools for library research. Go new places: Second Life. Free live conferencing. American Memory Exhibit. Kansas State Library is in SL. UConn Library Staff wiki for ITS Software. Demand usability from products and vendors. Do your own usability testing. Give constructive feedback: III User’s Group website. Branding is important for the vendor, but not for our finders. Know why web standards are important. Library 2.0 is not a religion. It’s not just about technology. It’s about awareness. Slow Library Ahead – L2 is not just about speed, it’s about customer service. PLCMC and Learning 2.0: libraries and fun. 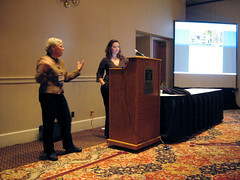 Scriblio is a program to help libraries create a stronger online presence developed by Casey Bisson of Plymouth State University and Lichen Rancourt of the Manchester (NH) Public Library. Lichen demonstrates why this just may be a new model for future OPACs. It provides keyword searching, faceted searching and browsing, persistent URLs for easy linking and full integration of website and catalog content and… it’s open source and can be used for free. Libraries are no longer just destinations, but are a platform for information exchange (library to patron and patron to patron). This is also what Web 2.0 does – lets people share information with each other easily. Geography is becoming less and less important, because some interaction happens online. If libraries are about serving communities and Web 2.0 is about building communities, then Web 2.0 needs library service. Because, what do libraries have that Web 2.0 tools don’t have? Librarians to help. This allows ILSs to serve patrons however they are searching online (the library website is just one avenue to the collection). Scriblio meets all of the above criteria – easy to use by non-experts, but provides expert information in an open and shared way. Is this tied in with LibraryThing? Is it really just two people doing this? Yes (Casey Bission does code, Lichen interacts with libraries, both develop ideas), with Jessamyn West helping with documentation. Do you work with other Open Source projects? Is this moving the idea of a community center online? ie, are you helping community patrons start and use flickr accounts, etc., so they can contribute, too? We hadn’t thought of it, but that’s a great idea. It’s also a great idea for programs. However, we do post information from patrons – one Trustee posted a video to YouTube of the 4th of July parade, and the library embedded that in a blog post. When will this be ready for us? Soon – maybe summer 2008. Contact Lichen for more information.